BOTOX® is an injectable solution used medically to treat excess sweating, migraine headaches, and certain muscular conditions. Cosmetically it is extremely effective at removing wrinkles, smoothing facial features, and reversing tired, angry, or aged appearances. It is made from a neurotoxin called botulinum toxin that is produced by the bacterium Clostridium botulinum which temporarily paralyzes injected muscles. Calgary BOTOX® Cosmetic is not a permanent treatment. If you discontinue treatment, the moderate to severe frown lines, crow’s feet and forehead lines will gradually return. and help reduce your embarrassing sweating or debilitating migraines with BOTOX®. Is BOTOX® Treatment Right For You? A combination of factors can cause facial lines. It’s not just about the cellular changes that may occur, reduction of collagen, or damage caused by free radicals from the sun and environment. Repeated muscle contractions from frowning, squinting, or raising eyebrows can cause the skin to furrow and fold, gradually resulting in the formation of facial lines. BOTOX® Cosmetic is a quick 10-minute treatment that works beneath the surface and temporarily reduces the underlying muscle activity that causes moderate to severe frown lines, crow’s feet and forehead lines in adults. For ultimate aesthetic results, you may want to pair BOTOX® with additional treatments such as a vampire facial. For longer lashes to compliment tightened, younger looking skin, ask about Latisse at a Calgary clinic. You may begin to notice results within 24 to 48 hours, but typically in the first few weeks, with results lasting up to 4 months for moderate to severe frown lines. BOTOX® Cosmetic is a technique-sensitive treatment. You can trust our trained staff to deliver subtle results so you’ll look like yourself—only with less noticeable lines. No one should be able to tell you’ve had anything done. 3% of patients experienced eyelid drooping in the studies involving frown lines. 1% of patients experienced eyelid swelling in the studies around crow’s feet, and 1% of patients experienced brow drooping in the forehead lines studies. Other possible side effects include: dry mouth; discomfort or pain at the injection site; tiredness; headache; neck pain; eye problems: double vision, blurred vision, decreased eyesight and dry eyes; and allergic reactions. 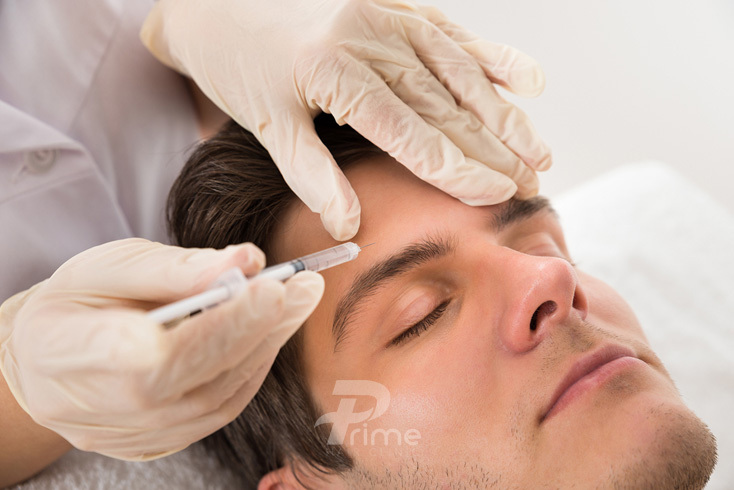 Do Men Receive Treatments Like BOTOX®? Yes! In the past three years alone, men have received over one million botulinum toxin treatments. When surveyed, the majority of men say they want to look good, and they’re bothered by the sign of aging they see in the mirror. 80% would choose to treat their crow’s feet first, 74% prioritize their forehead lines, and 60% would most like to treat their frown lines. BOTOX® is also the solution you’ve been looking for to reduce annoying over-sweating.